When these Chicago boys' third release starts with an intro by famed rapper Jay-Z, and then hearing that Babyface helped produce their new disc, many people would immediately write off this CD, or at least listen to it with a biased opinion. But they shouldn't because with Infinity On High , Fall Out Boy has made a flawless pop-punk record. People might say that this isn't a punk record, or that FOB is a bunch of posers, and many might even say that genres of music are to stay untangled with others. Forget that, because in the current state of cross-mingling music, there are no borders. The idea of getting the best to help you produce your music, lay vocals, and help with the overall process, is no new idea, and neither is the mindset of going into recording knowing that you are going to come out of it with one hell of a record. You can try to write off this disc, but two songs in, you realize that Fall Out Boy has got something great to show off. 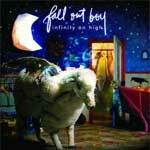 Infinity On High has heavy hitting jams, slow songs featuring piano and trumpets, faster tunes with violins, songs with choir-like background vocals, and fist-pumping choruses, which makes you completely forget about the improbable start, and draws you into brilliant melody that FOB is able to produce. While it is about as pop-punk as you can get, it's not cheesy. The guys look into the ever-present subjects of pop-punk a little more deeply than some of their counterparts, and it makes for a disc that is easy on the ears. This is a disc you find yourself playing over and over again on your iPod, and it doesn't matter what keeps you coming back for more, you just know that you are addicted and can't get enough. Those addictive qualities alone are proof enough for me that FOB has made a remarkable album! Most discs you own probably have a take it or leave it feel to them, and you can live without them. That is not the case with this disc. you cannot live without it. This disc is so intense, lively, and invigorating that it makes you feel like you got a fresh slap in the face from 'Dirty.' Only this is a first-class startling slap, and one that won't leave you with a black eye. In 'Carpal Tunnel of Love,' FOB is able to put together a marvelous punk rock song, with ample amounts of passion and force. Other than the radio-hit 'This Ain't A Scene, It's An Arms Race,' another standout hit is 'Fame<Infamy.' Nothing out of the ordinary or really special about it, it is just a song that is very well put together with both a solid piece of writing and musicianship, and it's one that gets stuck in your head. FOB even took the time to put together a piano masterpiece. In 'Golden,' Patrick and the piano are left on their own to fend for themselves. With a little bit of background vocals, this song is worth its weight in gold. On the last song of the CD, 'I've Got All This Ringing In My Ears.,' the guys are able to change up the pace a little bit unlike any other songs they have made so far. It features horns and different distortions than they've used before. It almost feels for a second like a hit from the timeless band 'Chicago,' with the horns, upbeat feel, and its sing along qualities. This disc has a great flow to it, and there aren't really any songs that you could say should have been left behind. Fall Out Boy put in their hard work, paid their dues, asked the help of some very qualified and well-known professionals, and it shows on this disc. It may be hard to believe, but this record might be better than either of the first two they have put out. It is a solid piece of work, a gem really, and will most likely be one of the best records of 2007.